Terms & Conditions - A.T.U.N. Welcome to atun.in, a service provided by NEW V.K.INTERNATIONAL. This website is owned and operated by NEW V.K.INTERNATIONAL(‘NEW V.K.INTERNATIONAL’, ‘we’ or ‘us’). Head Office” Plot no. 492 Udyog Vihar Phase- 5, Gurgaon, Haryana-122016. In using the atun.in service, of NEW V.K.INTERNATIONAL you are deemed to have accepted the Terms and Conditions of the agreement listed below or as may be revised from time to time, which is, for an indefinite period and you understand and agree that you are bound by such terms till the time you access this website. If you want to ask us anything about these terms & conditions or have any comments or complaints on or about our website, please email us at info@atun.in. All rights, including copyright, in this website are owned by or licensed to NEW V.K.INTERNATIONAL. Any use of this website or its contents, including copying or storing it or them in whole or part, other than for your own personal, non-commercial use is prohibited without the permission of NEW V.K.INTERNATIONAL. You may not modify, distribute or re-post something on this website for any purpose. NEW V.K.INTERNATIONAL has taken every care in the preparation of the content of this website, in particular to ensure that prices quoted are correct at time of publishing and all products have been fairly described. All prices are displayed inclusive of VAT. Packaging may vary from that shown. The weights, dimensions and capacities given are approximate only. We have made every effort to display as accurately as possible the colors of our products that appear on the website. However, as the actual colors you see will depend on your monitor, we cannot guarantee that your monitor’s display of any color will accurately reflect the color of the product on delivery. To the extent permitted by applicable law, NEW V.K.INTERNATIONAL disclaims all warranties, express or implied, as to the accuracy of the information contained in any of the materials on this website. NEW V.K.INTERNATIONAL shall not be liable to any person for any loss or damage which may arise from the use of any of the information contained in any of the materials on this website. All products/services and information displayed on atun.in(“Website” or “atun.in” or “Atun.in”) constitute an invitation to offer. Your order for purchase constitutes your offer which shall be subject to the terms and conditions as listed herein. Atun.in reserves the right to accept or reject your offer in part or in full. Our acceptance of your order will take place upon dispatch of the product(s) ordered. Dispatch of all the product(s) ordered, may or may not happen at the same time, in such a scenario that portion of the order which has been dispatched will be deemed to have been accepted by atun.in and the balance would continue to be on offer to atun.in and atun.in reserves the right to accept or reject such balance order. No act or omission of atun.in prior to the actual dispatch of the product (s) ordered will constitute acceptance of your offer. If you have supplied us with your email address, we will notify you by email as soon as possible to confirm receipt of your order and email you again to confirm dispatch and therefore acceptance of the order. Use of the Website is available only to persons who can form legally binding contracts under applicable law. Persons who are “incompetent to contract” within the meaning of the Indian Contract Act, 1872 including un-discharged insolvents etc. are not eligible to use the Website. If your age is below 18 years you are prohibited to use/purchase/contract from/with this website. Such persons are also prohibited from purchasing any material which is for adult consumption the sale or purchase of which to/by minors are strictly prohibited. atun.in reserves the right to terminate your membership and refuse to provide you with access to the website if atun.in discovers that you are under the age of 18 years. The website is not available to persons whose membership has been suspended or terminated by atun.in for any reason whatsoever. If you are registering as a business entity, you represent that you have the authority to bind the entity to this User Agreement. Unless otherwise specified, the materials on this website are directed solely at those who access this web from India. 612league.com makes no representation that any products or services referred to in the materials on this web are appropriate for use, or available outside India. Those who choose to access this website from outside India are responsible for compliance with local laws if and to the extent local laws are applicable. Atun.in will deliver the products only within in India and will not be liable for any claims relating to any products ordered from outside India. Some Indian states prohibit direct sale of merchandise from other states and require special documentation to effect such a sale without dual taxation, if atun.in receives an order from such states or to be delivered to such states (to see a list please refer our shipping policy) under such circumstances atun.in retains the right to accept or reject the order. Those who choose to access this website from Indian states which restrict such use are responsible for compliance with local laws if and to the extent local state laws are applicable. atun.in will deliver the products only within states having open import policy and will not be liable for any claims relating to any products ordered from restricted states. Except where additional terms and conditions are provided which are product specific, these terms and conditions supersede all previous representations, understandings, or agreements and shall prevail notwithstanding any variance with any other terms of any order submitted. By using the services of atun.in you agree to be bound by the Terms and Conditions. atun.in does not want to receive confidential, proprietary or trade secret information through this Website (excluding information related to any order you submit). Please note that any information, materials, suggestions, ideas or comments sent to atun.in will be deemed non-confidential. By submitting any such information, you are granting atun.in an irrevocable and unrestricted license to use, modify, reproduce, transmit, display and distribute such materials, information, suggestions, ideas or comments for any purpose whatsoever. However, we will not use your name in connection with any such materials, information, suggestions, and ideas or comments unless we first obtain your permission or otherwise are required by law to do so. Atun.in accepts payments for online orders through Bank Transfer only. You need to mention the Order ID as the payment reference while making the payment and email the proof of payment to us at info@atun.in. In case there is a problem in receipt of the payment due to a mistake done by you or your bank i.e, Beneficiary name, account number, amount of any other, it will be your responsibility to deal with your bank to get the same corrected. www.atun.in will process the order only once the payment is received into our account. You are requested to allow us a minimum of 2-3 working days to receive the online payment. There might be a delay in receipt/confirmation of payment on weekends and holidays. In case payment is not received within 7 days of order, the order will be cancelled on the 8th day. The order dispatch will be done within 3-4 working days post the receipt of the payment. Your product will be dispatched through the top logistics team such as FedEx and the like. Hence, the courier should take 3-5 working days to reach depending on the delivery location but we cannot guarantee the exact delivery time as it is a third party process subject to external factors. In case a non-delivery occurs on account of a mistake by you (i.e. wrong name or address or any other wrong information) or any other similar event, any extra cost incurred by www.atun.in for redelivery shall be claimed from you. Atun.in reserves the right, at our sole discretion, to limit the quantity of items purchased per person, per household or per order. These restrictions may be applicable to orders placed by the same account, the same credit / debit card, and also to orders that use the same billing and/or shipping address. We will provide notification to the customer should such limits be applied. Atun.in also reserves the right, at our sole discretion, to prohibit sales to any one as it may deem fit. While atun.in strives to provide accurate product and pricing information, pricing or typographical errors may occur. atun.in cannot confirm the price of a product until after you order. 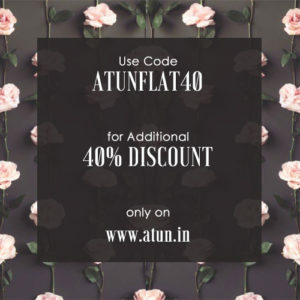 In the event that a product is listed at an incorrect price or with incorrect information due to an error in pricing or product information, atun.in shall have the right, at our sole discretion, to refuse or cancel any orders placed for that product, unless the product has already been dispatched. In the event that an item is mis-priced, atun.in may, at its discretion, either contact you for instructions or cancel your order and notify you of such cancellation. Unless the product ordered by you has been dispatched, your offer will not be deemed accepted and atun.in will have the right to modify the price of the product and contact you for further instructions using the e-mail address provided by you during the time of registration, or cancel the order and notify you of such cancellation. In the event that atun.in accepts your order the same shall be debited to your credit / debit card account and duly notified to you by email that the payment has been processed. The payment may be processed prior to atun.in dispatch of the product that you have ordered. If we have to cancel the order after we have processed the payment, the said amount will be reversed back to your credit / debit card/ bank account. In case payment is not received within 7 days of order, atun.in will cancel the order on the 8th day. Please note that there may be certain orders that we are unable to accept and must cancel. We reserve the right, at our sole discretion, to refuse or cancel any order for any reason. Some situations that may result in your order being canceled include limitations on quantities available for purchase, inaccuracies or errors in product or pricing information, or problems identified by our credit and fraud avoidance department. We may also require additional verifications or information before accepting any order. We will inform you if all or any portion of your order is canceled or if additional information is required to accept your order. If your order is cancelled after your credit / debit card has been charged or bank transfer has been done, the said amount will be reversed back in your Card/bank Account. We will seek authorization on your Card for the aggregate amount of the order placed by you, however, we may charge your card (capture) only with the amount corresponding to the actual portion of the order that we are able/willing to fulfill, and any associated shipping charges/taxes and levies etc. Any surplus amount, for which we might have originally sought and received an authorization on your card from your Card Issuer, if not captured by us in the time period stipulated by our Merchant Banker, will not be captured / charged. If however the same is charged to your card / bank account in error, we will refund it as soon as the same is realized by us or brought to our notice, whichever is sooner. Atun.in reserves the right to capture / charge your card to the full or partial authorized amount for the concerned order. Products ordered online on the website will not be eligible for any exchange/replacement/returns. You may carefully check the photographs, product description and size chart before placing your order. Atun.in will not entertain any exchange/return requests for orders placed online on the website. Atun.in will not accept any requests for reverse pickup/receive any return couriers for products you may like to exchange/return. In the unlikely event that you would like to exchange a product, you need to please bring it to one of our retail stores and get it exchanged for any item of the same value within 14 days of order placement. By placing an online order with atun.in, you indemnify atun.in of any claims of mismatch size, product not matching your specifications and the like. However if you have made your purchase at one of our retail physical stores, you can get products exchanged/returned as per the return/exchange policy mentioned on the retail invoice. atun.in and its associated acquiring bank or financial institutions reserve the right to recover the cost of goods, collection charges and legal proceeding fees from persons using the Website fraudulently. atun.in and its associated acquiring banks or financial institutions reserve the right to initiate legal proceedings against such persons for fraudulent use of the Website and any other unlawful acts or acts or omissions in breach of these terms and conditions. Before placing an order you should check the product description carefully. By placing an order for a product you agree to be bound by the conditions of sale included in the item’s description. Size Charts have been provided alongside every product and we understand the customer has checked the same and chosen their required size carefully. No request for exchange of size will be accepted. We do not do alterations of measurements/fit etc for online orders. All reviews, comments, feedback, postcards, suggestions, ideas, and other submissions disclosed, submitted or offered to atun.in on or by this Website or otherwise disclosed, submitted or offered in connection with your use of this Website (collectively, the “Comments”) shall be and remain atun.in property. Such disclosure, submission or offer of any Comments shall constitute an assignment to atun.in of all worldwide rights, titles and interests in all copyrights and other intellectual properties in the Comments. Thus, atun.in owns exclusively all such rights, titles and interests and shall not be limited in any way in its use, commercial or otherwise, of any Comments. atun.in will be entitled to use, reproduce, disclose, modify, adapt, create derivative works from, publish, display and distribute any Comments you submit for any purpose whatsoever, without restriction and without compensating you in any way. atun.in is and shall be under no obligation (1) to maintain any Comments in confidence; (2) to pay you any compensation for any Comments; or (3) to respond to any Comments. You agree that any Comments submitted by you to the Website will not violate this policy or any right of any third party, including copyright, trademark, privacy or other personal or proprietary right(s), and will not cause injury to any person or entity. You further agree that no Comments submitted by you to the Website will be or contain libelous or otherwise unlawful, threatening, abusive or obscene material, or contain software viruses, political campaigning, commercial solicitation, chain letters, mass mailings or any form of ‘spam’. atun.in does not regularly review posted Comments, but does reserve the right (but not the obligation) to monitor and edit or remove any Comments submitted to the Website. You grant atun.in the right to use the name that you submit in connection with any Comments. You agree not to use a false email address, impersonate any person or entity, or otherwise mislead as to the origin of any Comments you submit. You are and shall remain solely responsible for the content of any Comments you make and you agree to indemnify atun.in and its affiliates for all claims resulting from any Comments you submit. atun.in and its affiliates take no responsibility and assume no liability for any Comments submitted by you or any third party. atun.in and its suppliers and licensors expressly reserve all intellectual property rights in all text, programs, products, processes, technology, content and other materials, which appear on this Website. Access to this Website does not confer and shall not be considered as conferring upon anyone any license under any of atun.in or any third party’s intellectual property rights. All rights, including copyright, in this website are owned by or licensed to atun.in. Any use of this website or its contents, including copying or storing it or them in whole or part, other than for your own personal, non-commercial use is prohibited without the permission of atun.in. You may not modify, distribute or re-post anything on this website for any purpose. The atun.in names and logos and all related product and service names, design marks and slogans are the trademarks or service marks of NEW V.K.INTERNATIONAL. Access to this Website does not authorize anyone to use any name, logo or mark in any manner. References on this Website to any names, marks, products or services of third parties or hypertext links to third party websites or information are provided solely as a convenience to you and do not in any way constitute or imply atun.in endorsement, sponsorship or recommendation of the third party, information, product or service. atun.in is not responsible for the content of any third party websites and does not make any representations regarding the content or accuracy of material on such websites. If you decide to link to any such third party websites, you do so entirely at your own risk. All materials, including images, text, illustrations, designs, icons, photographs, programs, music clips or downloads, video clips and written and other materials that are part of this Website (collectively, the ‘Contents’) are intended solely for personal, non-commercial use. You may download or copy the Contents and other downloadable materials displayed on the Website for your personal use only. No right, title or interest in any downloaded materials or software is transferred to you as a result of any such downloading or copying. You may not reproduce (except as noted above), publish, transmit, distribute, display, modify, create derivative works from, sell or participate in any sale of or exploit in any way, in whole or in part, any of the Contents, the Website or any related software. All software used on this Website is the property of atun.in or its suppliers and protected by Indian and international copyright laws. The Contents and software on this Website may be used only as a shopping resource. Any other use, including the reproduction, modification, distribution, transmission, republication, display, or performance, of the Contents on this Website is strictly prohibited. Unless otherwise noted, all Contents are copyrights, trademarks, trade dress and/or other intellectual property owned, controlled or licensed by atun.in, one of its affiliates or by third parties who have licensed their materials to atun.in and are protected by Indian and international copyright laws. The compilation (meaning the collection, arrangement, and assembly) of all Contents on this Website is the exclusive property of atun.in and is also protected by Indian and international copyright laws. You understand that by using this Website or any services provided on the Website, you may encounter Content that may be deemed by some to be offensive, indecent, or objectionable, which Content may or may not be identified as such. You agree to use the Website and any service at your sole risk and that to the fullest extent permitted under applicable law, atun.in and its affiliates shall have no liability to you for Content that may be deemed offensive, indecent, or objectionable to you. You agree to defend, indemnify and hold harmless atun.in, its employees, directors, officers, agents and their successors and assigns from and against any and all claims, liabilities, damages, losses, costs and expenses, including attorney’s fees, caused by or arising out of claims based upon your actions or inactions, which may result in any loss or liability to atun.in or any third party including but not limited to breach of any warranties, representations or undertakings or in relation to the non-fulfillment of any of your obligations under this User Agreement or arising out of your violation of any applicable laws, regulations including but not limited to Intellectual Property Rights, payment of statutory dues and taxes, claim of libel, defamation, violation of rights of privacy or publicity, loss of service by other subscribers and infringement of intellectual property or other rights. This clause shall survive the expiry or termination of this User Agreement. This User Agreement is effective unless and until terminated by either you or atun.in. You may terminate this User Agreement at any time by informing us in writing through Indian postal system by registered post, that you no longer wish to be associated with this website, provided that you discontinue any further use of this Website. Atun.in may terminate this User Agreement at any time and may do so immediately without notice, and accordingly deny you access to the Website. Such termination will be without any liability to atun.in. Upon any termination of the User Agreement by either you or atun.in, you must promptly destroy all materials downloaded or otherwise obtained from this Website, as well as all copies of such materials, whether made under the User Agreement or otherwise. Atun.in’s right to any Comments shall survive any termination of this User Agreement. Any such termination of the User Agreement shall not cancel your obligation to pay for the product already ordered from the Website or affect any liability that may have arisen under the User Agreement. The Website is provided without any warranties or guarantees and in an “As Is” condition. You must bear the risks associated with the use of the Website. The Website provides content from other Internet websites or resources and while atun.in tries to ensure that material included on the Website is correct, reputable and of high quality, it cannot accept responsibility if this is not the case. Atun.in will not be responsible for any errors or omissions or for the results obtained from the use of such information or for any technical problems you may experience with the Website. This disclaimer does not apply to any product warranty offered by the manufacturer of the product as specified in the product specifications. This disclaimer constitutes an essential part of this User Agreement. To the fullest extent permitted under applicable law, atun.in or its suppliers shall not be liable for any indirect, incidental, special, consequential or exemplary damages, including but not limited to, damages for loss of profits, goodwill, use, data or other intangible losses arising out of or in connection with the Website, its services or this User Agreement. Without prejudice to the generality of the section above, the total liability of atun.in to you for all liabilities arising out of this User Agreement be it in tort or contract is limited to the amount charged to you, against the value of the products ordered by you. Atun.in its associates and technology partners make no representations or warranties about the accuracy, reliability, completeness, currentness and/or timeliness of any content, information, software, text, graphics, links or communications provided on or through the use of the Website or that the operation of the Website will be error free and/or uninterrupted. Consequently, atun.in assumes no liability whatsoever for any monetary or other damage suffered by you on account of the delay, failure, interruption, or corruption of any data or other information transmitted in connection with use of the Website; and/or any interruption or errors in the operation of the Website. Violations of system or network security may result in civil or criminal liability. Atun.in will investigate occurrences that may involve such violations and may involve, and cooperate with, law enforcement authorities in prosecuting users who are involved in such violations. You agree not to use any device, software or routine to interfere or attempt to interfere with the proper working of this Website or any activity being conducted on this Website. You agree, further, not to use or attempt to use any engine, software, tool, agent or other device or mechanism (including without limitation browsers, spiders, robots, avatars or intelligent agents) to navigate or search this Website other than the search engine and search agents available from atun.in on this Website and other than generally available third party web browsers (e.g., Netscape Navigator, Microsoft Internet Explorer). If any part of this agreement is determined to be invalid or unenforceable pursuant to applicable law including, but not limited to, the warranty disclaimers and liability limitations set forth above, then the invalid or unenforceable provision will be deemed to be superseded by a valid, enforceable provision that most closely matches the intent of the original provision and the remainder of the agreement shall continue in effect. Unless otherwise specified herein, this agreement constitutes the entire agreement between you and atun.in with respect to the atun.in websites/services and it supersedes all prior or contemporaneous communications and proposals, whether electronic, oral or written, between you and atun.in with respect to the atun.in websites/services. Atun.in’s failure to act with respect to a breach by you or others does not waive its right to act with respect to subsequent or similar breaches. This User Agreement shall be construed in accordance with the applicable laws of India. The Courts at Gurgaon shall have exclusive jurisdiction in any proceedings arising out of this agreement. Any dispute or difference either in interpretation or otherwise, of any terms of this User Agreement between the parties hereto, the same shall be referred to an independent arbitrator who will be appointed by NEW V.K.INTERNTIONAL. and his decision shall be final and binding on the parties hereto. The above arbitration shall be in accordance with the Arbitration and Conciliation Act, 1996 as amended from time to time. The arbitration shall be held in GURGAON. The High Court of judicature at Gurgaon alone shall have the jurisdiction and the Laws of India shall apply. Atun.in may at any time modify the User Agreement without any prior notification to you. Subsequent to any modification of the User Agreement, we will inform you of the modifications in the User Agreement via e-mail at the address provided by you while registering on atun.in. You can access the latest version of the User Agreement at any given time on atun.in. You should regularly review the User Agreement on atun.in. In the event the modified User Agreement is not acceptable to you, you should discontinue using the service. However, if you continue to use the service you shall be deemed to have agreed to accept and abide by the modified User Agreement.